He was born without arms and legs. He went through hating God, being depressed, and trying to kill himself all by the age of 10. He is someone who most people wouldn't even give a second thought about. After all, what can a man without arms and legs really do? Nick Vujicic, motivational speaker and spreader of the word of God was born without arms and legs but he had a vision, a desire, and the heart and mind which he used to pursue his gift and vision. He did not allow the fact that he had no arms and legs to stop him. Instead, he used this disadvantage to make himself better. He believes that hope is priceless. He believes that everyone has a purpose. He does not believe that he is limited; on the contrary, he believes that he is limitless. He was told that he could never walk and now he surfs. He puts his focus on something and does not allow himself to accept failure. He tries and tries and tries until he eventually succeeds. We all have disabilities; disabilities of the heart. The heart, the mind, and the spirit need to work together and when that happens, the possibilities become limitless despite any perceived disabilities. He was just so inspiring. It was crazy how he only talked for less than an hour and yet, it felt like he was talking for hours with the many wisdom he was able to impart. So here are the 5 things that I learned from him. Family is more important than any business or money making scheme. Nick said that he would rather be poor than be rich by lying. He values his family more than anything. He had over 1000+ unread text messages but when he has dinner at home with his wife, he doesn't get to be on the phone. Family comes first. You are beautiful just the way you are. 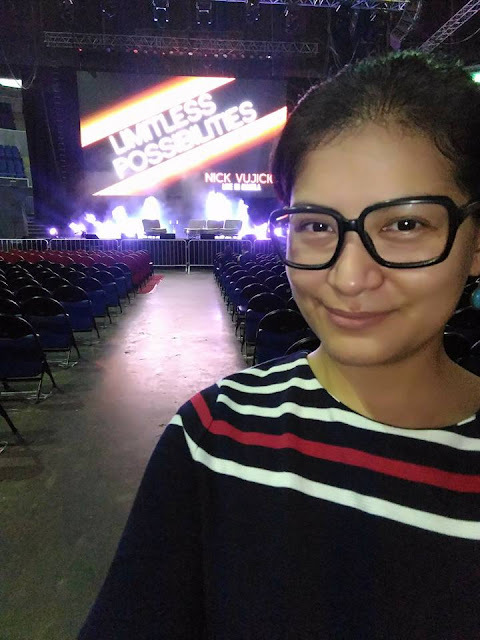 Nick Vujicic has no arms and legs and I tell you, when he was placed on stage, he was the most beautiful thing that you would see. He was just so full of life. If you're not happy single, you won't be happy with someone else. You need to learn to love yourself to be happy. We are all perfectly imperfect. Nick Vujicic sees himself that way and we should too. We have arms and legs or may have imperfections but really, if he can see himself as being perfectly imperfect, how can we not? The man has no arms and legs for crying out loud. Believe in God. Everything happens for a reason and God will never let anything happen to you if it wasn't meant to happen to you. I went home with a new sense of possibilities and hope for myself and my family that we can recover from the slump we are in ... that the future is bright ... and that everything is possible. I went home believing and knowing that indeed, there are limitless possibilities. We just need to claim them, want them hard enough, and be willing to fail and fail until we succeed. All things are possible if the heart, mind, and spirit will be one. I was following Nick Vujicic for a long time since he was famous. He`s a motivational speaker and spreader who heals lots of peoples souls. This is inspiring! These are things that I just need to hear or read right now. Nick Vujicic is admirable. I wish I had his strength and I wish I could be as positive as he is. I, too, agree that hope is priceless. It gives us the willpower to soldier on. I too believe that all things are possible. I love that you learned so much by his inspiration. He sounds really amazing. It must have been really amazing and inspiring to hear him speak live. He must have gone through a lot of soul searching in order to concur and accept his meaning in life and disability. I am learning to be healthy in loving as I teach loving. I can't imaging living life like that, he is truly an inspiration and he's such an amazing person. I love the lessons that you have here, very simple rules but very true! I'd never heard of Nick before your post. He sounds very inspirational. Nick is an inspiration. Too bad wasnt able to watch him live. ive got a few of his books and they are like him, very inspiring to read. He is a great Preacher and many people would admire him because he is inspiration. Nick is a very inspiring person. When you look at him, no way you can say to yourself that you can't do it! I have never heard of Nick Vujicic before, but looked him up after reading this. Very cool backstory. I've only been to one motivational speaking engagement before…it was Spike Lee. I've heard of him before, but have never seen him speak. That must have been so inspiring!